SIX SETS for the price of FIVE! 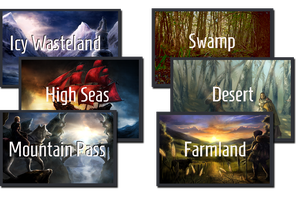 : High seas, Icy wasteland, Mountain Pass, Farmland, Desert, Swamp. This SoundPack brings you a lovely cross section of very useful and mostly pleasant natural environments. Many people love to put these soundscapes on in the background as they work, or study, or write. The Creator of Syrinscape even puts them on while he is composing. Even better if you happen to be playing some kind of Roleplaying game put on these rich tabletop audio solutions and your players will soon be immersed in the game... and in the case of the Swamp, they'll really want to get un-immersed as soon as possible! See the individual product listings in the store for demo videos of each SoundSet. The music and sound effects in this SoundSet were imagined, composed, compiled, designed, created, processed, and mixed by Benjamin Loomes of syrinscape.com.